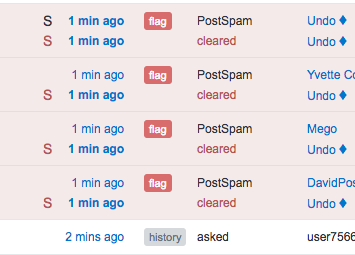 metasmoke now checks folks' moderator status every day right before the spam wave (i.e. quite a few hours after folks get their diamonds from elections) and will flat-out refuse to flag something with a diamond account. yep, Devise doesn't like the serialize statement, but only on local. Bizarre. Restart: API quota is 7373. @CaffeineAddiction that's not gonna work. Feedback is sd <feedback>, no !! @CaffeineAddiction Yes, you are a privileged user. @CaffeineAddiction [:35444210] That message is not a report. Hiya. Some guy is spamming an answer (15x so far) on SO, apparently affiliated with the lib he promotes. Is stuff like that in the scope of sd? maybe, do you have a link to one of his posts? or a link to his account? All relevant links are reported by Guttenberg in SOBotics. @CaffeineAddiction So my custom flag is enough? @BaummitAugen what makes you think he's affiliated? FWIW, I've heard of Conda before, which means it's probably not malicious at least, and I can't find anything at a glance linking him with it. @CaffeineAddiction aye, but that doesn't necessarily mean he's affiliated. People do dumb things, especially on SO. @ArtOfCode I thought Scrapy and Scrapinghub was the same thing. Mebbe not. @ArtOfCode The latter is in his profile. Does either smoky or metasmoke have a web apps post? I'm looking for a post on WebApps about either Smoky or MS.
oh I want that true instant wrinkle formula, I want to look like I'm 202! @CaffeineAddiction [:35445050] Recorded question as true positive in metasmoke. Use tpu or trueu if you want to blacklist a user. @CaffeineAddiction: It seems this is your first time sending feedback to SmokeDetector. Make sure you've read the guidance on your privileges, the available commands, and what feedback to use in different situations. @CaffeineAddiction [:35445125] That message is not a report. To make sure I'm not embarassing myself even more...there isn't one for Smokey, right? @Undo @ArtOfCode metasmoke.erwaysoftware.com/post/57298 somehow it let me vote twice intended? @CaffeineAddiction the first one of those came from chat, the second from review on MS. In the Google Doc there is a link to: metasmoke.charcoal-se.org Is this correct? @CaffeineAddiction [:35445456] That message is not a report. @CaffeineAddiction [:35445458] That message is not a report. @CaffeineAddiction you're simply pinging smokey, you need to make sure that it's a reply. Just hover on the message, then click the little arrow that appears on the right. Updated the v4. @Undo what's your new v6 for metasmoke? 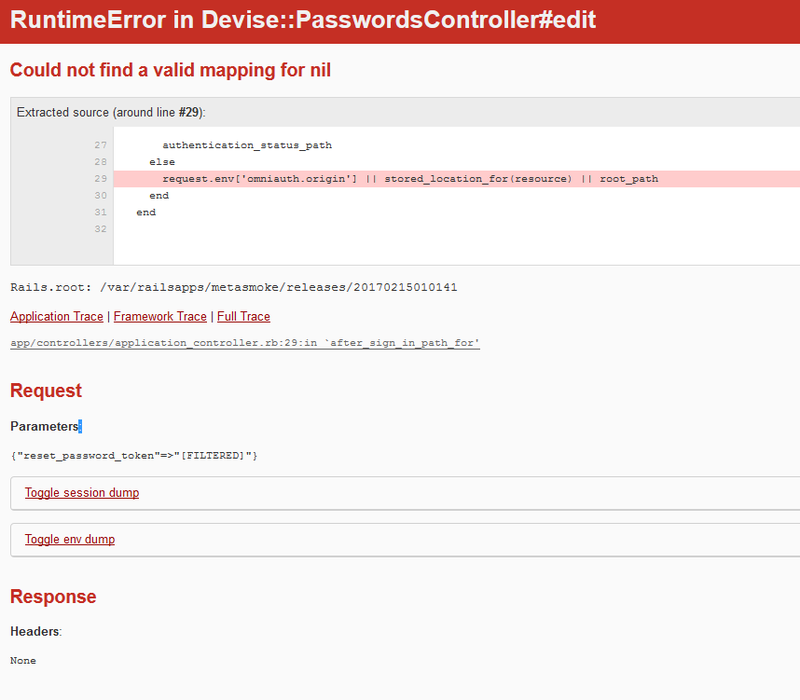 @tripleee suspect DNS won't like that; what's the full form? @Andy Is this before or after clicking the link in the email? Email from the last couple hours? @Undo mind giving me write access to RFC1? @Andy What's the link you clicked? @ArtOfCode That post was automatically flagged, using flags from: Mithrandir, Ferrybig, Magisch. @Undo Request the password again? Or did you send me the email again? Where'd it redirect you to? @CaffeineAddiction Recorded answer as an NAA in metasmoke. @ArtOfCode are both of those images in the draft uploaded to imgur? And, when I have this in markdown/editted, do you want me to paste it in the doc as a new page or in a gist for you to look over first? > The above graph plots the cumulative weight of the reasons that caught a post (one reason’s weight is equal to its percentage accuracy) against the counts of true positive reports and total reports on the left-hand scale, and against the overall accuracy percentage on the right-hand scale. Can we clean it up a bit? This spam post (already reported) is still around. - Eliminated some things that were repeated over and over again repeatedly, repeated. Repeat. @Andy May want to change "We will cast up to three flags" -> "Our system will automatically cast up to 3 spam flags"
@Andy Also may want to add a paragraph with stats, like we caught X true positives yet, Y automatic spam flags yet, Z users trusted us with the ability to cast flags in their name, etc. @ArtOfCode I am conflicted on that. They are good to have, but having them makes the post longer and doesn't really explain the system that much. also, minor things: "web dash board" -> "web dashboard"; "your safety checks" -> "our safety checks" (consistency); "finish of" -> "finish off"
@Andy I think "Over the years, Smoke Detector caught X (some 40k) true spam positives, and Y users have contributed to the project. Presently, 22 users trust us to cast spam flags in their name, and we have cast $Z automatic spam flags over the past $time"
Do you guys have a strategic time to post this in mind? We should probably coordinate this at a time of high meta activity and then have people cover for a while to respond to inquiries. I'm sorta tempted to have spokespeople because that removes the need for co-ordination, but it does also prevent a bunch of good people weighing in. the goal is to get as many people as possible to know, right? isnt it already written in python?